Roberts Electric is proud of our Diamond Certified rating. For 17 straight years, we’ve received our ranking, and our own customer feedback results confirm that clients recognize and place a high value on this rating system. Diamond Certified goes through a very thorough process to vet its clients. When you choose a vendor that has achieved the Diamond Certified rating, you can be assured that this company is selling a quality product, that it’s bonded and properly insured and consistently provides a high level of customer satisfaction. The Diamond Certified-seal means that someone else has done your homework for you. Surveys a large, random sample of typically 400 real customers, by telephone, to get the most accurate rating and verify only actual customers are responding. By surveying from a company’s entire customer base, ensures the results of the study, good or bad, truly represents the company’s customer-satisfaction level. Confirms that the company has required insurances and valid state-mandated credentials. Assures that the company is performing to contract, has customer-friendly business practices and stands behind its work. Conducts ongoing research and ratings to ensure all companies maintain their high performances. All responses for each Diamond Certified company are displayed on its Diamond Certified Company Report page. All respondents are identified by first names and last initials to protect their privacy. If a response is overtly negative or a respondent’s first name is easily identifiable because of uniqueness, the name will be altered using a strict formula. This protects the anonymity of the respondents while including their feedback for others to review. Companies must score Highest in Quality in customer satisfaction (a 90+ on a 100 scale) and pass all credential-based ratings to earn Diamond Certified. By requiring a high score to qualify, Diamond Certified eliminates mediocre and poorly performing companies. Companies that are able to qualify for and maintain their Diamond-Certified ratings are much more likely to keep delivering quality to their customers. 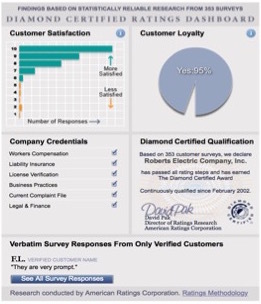 Interested in learning more about Roberts Electric’s Diamond-Certified rating? Our Diamond Certified Report page has a list of all of our customer interview responses as well as videos about understanding your home’s electrical system and tips for choosing lighting for your home.